One of the biggest events this year – General Elections 2019 – is fast approaching and all the political parties have started gearing up for the battle to the throne. Most of these parties now understand the power of social media and they have started pumping up their ad spends on Facebook. Even though the initial figures coming in now are very small compared to what will be the ultimate spend, Bharatiya Janata Party (BJP) is leading in the political ad spend on Facebook. BJP and its affiliates made up for over 50 percent of the total ad spend on Facebook, according to data made available by the social media company for February. BJP is followed by regional parties, while the Indian National Congress and its affiliates ranked third in the political ad spending in February. Affiliates include individuals from a party, ministers, MPs, MLAs and organisational leaders, and outfits that clearly seek backing for a particular party as well as fan pages on Facebook. 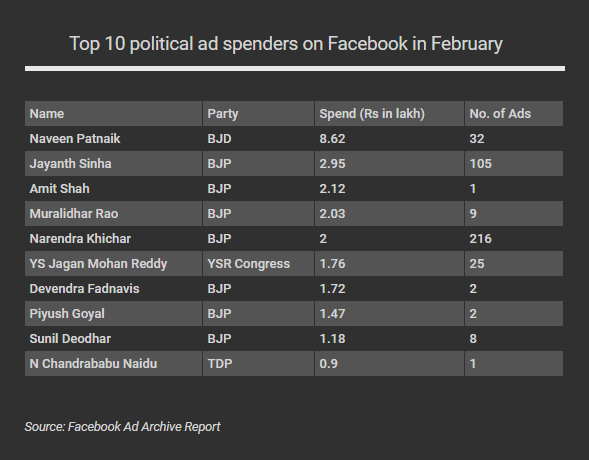 The BJP and its affiliates spent Rs 2.37 crore in February on Facebook advertisements. Regional parties spent about Rs 19.8 lakh, while the Congress and its affiliates spent around Rs 10.6 lakh. Among regional parties, the big spenders were the Biju Janata Dal (BJD), Nationalist Congress Party (NCP), Telugu Desam Party (TDP), YSR Congress Party and the Shiv Sena. “These social media advertising spends are just a curtain-raiser. The fact is that there is a marketing juggernaut in the DNA of the BJP. They believe in brand building and social media,” brand consultant Harish Bijoor told The Economic Times. Earlier, BJP leaders involved in election-related publicity told the newspaper that social media will account for 20-25 percent of the party’s total ad spend by the time campaigning is over. In February, Facebook said that it is toughening up the rules governing political advertisements in India to create more transparency ahead of the country’s general elections due before May. All Indian political advertisements on Facebook now have to abide by the company’s authorisation process launched in December and display details of their publishers and funders. Political advertisements on Facebook are gaining traction as the social media platform has over 294 million monthly active users in India as of October 2018, according to Statista. Experts say that BJP’s spending is on expected lines. “BJP’s spend is on expected lines. They are carpet-bombing the media,” Karthik Srinivasan, a communications consultant and former national lead, social, at Ogilvy told the newspaper.